National Institute for Health and Clinical Excellence (NICE) guideline CG67 recommends that acute coronary syndrome (ACS) cases are treated with high-intensity statins (defined as statins used in doses that produce greater cholesterol lowering than simvastatin 40 mg). The objective of this study was to describe current UK prescribing of statins following ACS. This study used data from linkage between the Myocardial Ischaemia National Audit Project (MINAP) database and the General Practice Research Database (GPRD). The study included adults aged 40+ with a discharge diagnosis in MINAP of myocardial infarction, troponin positive or negative ACS discharged alive to home. A total of 6,138 ACS cases were included. Most ACS cases were prescribed both a statin at hospital discharge and by their GP, however, 340 of the 6,138 ACS cases (5.5%) had no record of statin prescription from either source. Of the ACS cases prescribed a statin by their GP, 30.1% received a high-intensity statin dose. At year four, 43% (95% confidence interval [CI] 41–45%) of ACS cases prescribed a statin remained on treatment (42% for those starting low and 45% for high intensity). In conclusion, statin therapy is provided to most ACS cases in the UK but duration and dosage is shorter and lower than recommended. The main objectives of this study were to describe current prescribing of statins and assess the extent of high-intensity prescribing following an ACS in the UK. Persistence with statin treatment over time was also evaluated. This study used data from a unique linkage between the Myocardial Ischaemia National Audit Project (MINAP) database with extensive clinical details on patients hospitalised for ACS and the General Practice Research Database (GPRD) with long-term longitudinal follow-up information. The data recorded in the GPRD include demographic information, prescription details, clinical events, preventive care provided, specialist referrals, hospital admissions, and major outcomes. GPRD currently includes data on over 10 million patients.3 A total of 225 English GPRD practices are now linked individually and anonymously to the national registry of hospital admissions (Hospital Episode Statistics [HES]) and disease registries such as MINAP. MINAP covers all acute hospitals in England and Wales (n = 229).4-7 Data are collected prospectively at each hospital.4-7 Each patient entry offers details of the patient journey, including the method and timing of admission, inpatient investigations, results and treatment. Data entry is subject to routine online error checking. registered with the GPRD practice for at least one year prior to the ACS. Among patients who were prescribed a statin in GPRD (Groups 1 and 3 above), patients were further categorised into either ‘high-’ or ‘low-’ intensity statin use based on the strength of the prescribed medication and the GP dosing instructions. Low-intensity statin therapy was defined as the following daily doses: atorvastatin 10 mg, pravastatin 10 to 40 mg, simvastatin 10 to 40 mg, fluvastatin 20 to 40 mg, and rosuvastatin 5 mg. High-intensity statin therapy was defined as the following daily doses: atorvastatin 20 to 80 mg, simvastatin 80 mg, fluvastatin 80 mg, and rosuvastatin 10 to 40 mg.8 Data collection occurred prior to the Food and Drug Administration (FDA) recommendation to limit the use of simvastatin 80 mg because of increased risk of muscle damage. The study population was followed from the index date until end of GPRD follow-up (i.e. date of death, patient’s transfer out of the practice, last GPRD data collection at the time of this study [January 2010], whichever date came first). Age, gender, socioeconomic status, body mass index (BMI) and alcohol consumption status were obtained from GPRD along with long-term statin prescribing information. Socioeconomic status was calculated using the Index of Multiple Deprivation for the postcode of the practice. MINAP was utilised to describe the discharge details and statin prescription at discharge (not including detail on dose). HES records were used to estimate the number of hospitalisations during the 24 months prior to the index date. Analyses were performed using Stata Statistical Software: Release 10.1 (StataCorp, 2009). Maximum-likelihood multinomial logit models were utilised to compare patient characteristics between each of the four statin use categories. Logistic regression models evaluated the predictors for statin prescribing. 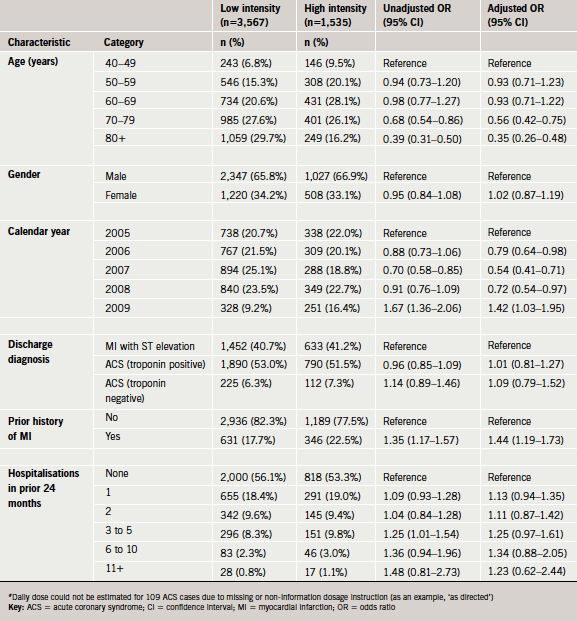 Adjusted models included age, gender, ethnicity, region of the GPRD practice, discharge diagnosis; prior history of angina, MI, diabetes, BMI, alcohol consumption, smoking status, cholesterol level, emergency percutaneous coronary intervention (PCI) and additional emergency PCI, hospitalisations in the prior 24 months, use of ezetimibe, low molecular weight heparin, intravenous glycoprotein IIb/IIIa agents, intravenous beta blocker, calcium antagonists, oral nitrate, potassium channel modulator, warfarin, angiotensin-converting enzyme (ACE) inhibitor or angiotensin-receptor blocker (ARB), thiazide diuretic, loop diuretic, streptokinase, alteplase, reteplase, tenecteplase and fondaparinux; and calendar year. Missing and unknown values of categorical variables were combined in a ‘missing value’ category for descriptive purposes. Logistic regression models were used for the predictors of high-intensity statin prescribing by the GP. Long-term persistence with statin therapy was evaluated using GPRD prescription data. Discontinuation was defined as no repeat prescription within a 182-day period after a statin prescription (this interval of 182 days was based on average prescription duration of 28 days combined with an allowable gap of 154 days between the expected end and start of two subsequent prescriptions). Cox proportional hazard regression models were used to determine the factors associated with persistence in statin treatment. Adjusted models contained the covariates listed above, plus the intensity of the statin therapy. The study population included 6,138 ACS cases. Table 1 shows its characteristics at the index date. The majority of ACS cases (64.5%) were men and 55.6% were aged 70 years or older. The discharge diagnosis was troponin positive ACS in 54.4% of the cases, MI with ST elevation in 38.0% and troponin negative in 7.6%. In total, 32.3% of the ACS cases were recorded as using statins at the time of admission. A statin was prescribed at hospital discharge in 90.7% of the ACS cases, while 1.2% had contraindications. As shown in table 2, a large majority of ACS cases were prescribed both a statin at hospital discharge and by their GP (Group 1 representing 81.2% of the ACS cases). Only 340 of the 6,138 ACS cases (5.5%) had no record of statin prescription in either source (Group 4). Elderly ACS cases (aged 80 and over) were less likely to receive a statin at either hospital discharge or general practice compared with patients aged 40–49 years. It was found that there were no major differences between the hospital and general practice in the predictors of statin prescribing following an ACS (table 3). Only 30.1% (1,535 of 5,102) of the ACS cases prescribed a statin by their GP received a high-intensity statin dose (54 of these were prescribed simvastatin 80 mg). High-intensity statins were less likely to be prescribed at older ages (odds ratio [OR] 0.35, 95% confidence interval [CI] 0.26–0.48, at age 80+ compared with aged <50 years) and patients with a history of MI were more likely to be prescribed a high-intensity statin (OR 1.44, 95% CI 1.19–1.73) (table 4). A higher proportion of patients received a higher-intensity statin in the six months post-NICE guidance (33%) compared with the six months before the CG67 guideline was released in May 2008 (26%) (OR 1.38, 95% CI 1.02–1.86). The majority of ACS cases stopped statin therapy within four years of treatment (table 5). At year four, only 43% of the ACS cases were still using a statin. Age, gender and dose intensity did not predict long-term persistence to statin therapy. Only a small number of patients switched from high- to low-intensity statin therapy. Of the ACS cases who started on high-intensity statin therapy and persisted, 73% were still using high intensity at year four. In this study, we were able to confirm that the majority of patients with an ACS event were discharged on a statin followed by the GP taking over this treatment (81.2%). However, it is clear from this result that there is still scope for improvement and ensuring that all patients receive a statin at both discharge and with near-term follow-up by their GP, which would be likely to improve adherence and outcomes. Furthermore, most patients received low-dose statin therapy and the proportion of patients initiating a high-intensity statin was lower than expected, even after the new NICE guideline issued in 2008.1 Although statin therapy is intended to be long term, a substantive proportion of ACS cases discontinued statin therapy over time, both with high-intensity and lower-dose therapy. Linking primary care data from GPRD with hospital data from MINAP represents a new and valuable option for ACS research. This linkage is done in an anonymous manner with protection of the privacy of patients. The MINAP data provide more in-depth information about a hospitalisation for ACS than is available in GPRD, particularly regarding admission characteristics, medications and procedures such as PCI occurring during the hospitalisation. Combining the in-depth cross-sectional information about an ACS event with the longitudinal primary care medical records prior to and following the ACS event along with the secondary care history of hospitalisations from HES provides a powerful new combination for research. The NICE CG67 guideline1 was adhered to in most ACS cases with respect to initiation of statin therapy. The proportion of ACS cases receiving a statin following the ACS (94.5%) was higher compared with a figure of 50.3% of ACS cases observed in a study in Scotland during 1993–2001.9 The extent of statin prescribing at discharge was broadly similar to that reported in a recent French study of 2,500 MI cases.10 However, the adherence to the NICE guidelines was much lower with respect to the prescribed dosage of statin therapy. More than half of the ACS cases did not receive high-intensity statin therapy in 2009. The reason for this low adherence to NICE guidelines is unknown. The present study could not evaluate whether high-intensity statin therapy was prescribed by the hospital but not followed by the GP (MINAP does not record statin dose) but this seems unlikely, as we did not find any major differences between the prescribing of statins between the GPs and hospitals. An evaluation of the reasons behind the lower prescribing of high-intensity statins would be useful. While guidelines are developed by NICE in a meticulous and detailed manner, less attention seems to be paid to evaluating the implementation of guidelines and any barriers. Several studies have reported, in line with the present study, that the long-term persistence and adherence to statin therapy is low.11-14 Although the adherence is better with statin therapy compared with some other long-term therapies, such as bisphosphonates,15 the majority of ACS cases will only be prescribed a statin for a few years while remaining at high risk of recurrent cardiovascular disease. The 2008 NICE guideline on lipid modification briefly acknowledges that the persistence and compliance to therapies for the prevention of cardiovascular disease is poor and that non-adherence is associated with poor outcomes.1 However, no guidance was provided on how to improve the long-term adherence to statin therapy. A series of interventions has been proposed in order to enhance persistence with medications (including counselling, reminders, reinforcements and other forms of supervision and attention),16-18 but despite the low patient persistence with long-term statin therapy, there has been no NICE guidance on how to deal with this in a cost-effective manner. Evidence-based medicine should not just be the translation of ‘perfect’ clinical trial evidence into guidelines but should also explicitly consider the barriers for implementation of guidelines in the ‘imperfect’ actual clinical practice. There are several limitations with this study. A key limitation is that data were collected over a period that mainly pre-dates the current NICE guidelines. However, we have extracted data six months before and after the guideline was published, which did not show a large shift in prescribing in terms of high-intensity statins. A further limitation of this study is that the GPRD database does not include information on why patients discontinued statin therapy. The present study also was not able to measure actual drug intake and simvastatin 10 mg has been available in low dosage over-the-counter, though usage is low. The linkage was limited to 225 English practices at the time of the study that consented to participate in the linkage. We only included patients who were discharged to home rather than all patients who were discharged alive. This was done to ensure that patients were home and thus eligible to receive a prescription from their general practice. There are also different recording practices between MINAP and GPRD. In GPRD, data are either entered by the GP or practice staff (based on diagnoses by the GP or based on information from referral letters) or sent electronically to the practice (e.g. some laboratory data). In MINAP, hospital staff record information based on a review of the hospital records. In conclusion, statin therapy is provided to most patients following an ACS, but most patients did not receive high-intensity statin therapy and also did not continue statin therapy for a prolonged period of time. The proportion of patients remaining on high-intensity statins decreased for each time interval since the start of prescribing. Development of guidelines should be followed by careful analyses of their implementation and any associated barriers. GPRD is owned by the UK Department of Health and operates within the Medicines and Healthcare products Regulatory Agency (MHRA). GPRD receives funding from the MHRA, Medical Research Council, various universities, contract research organisations, and pharmaceutical companies. The Department of Pharmacoepidemiology & Pharmacotherapy, Utrecht Institute for Pharmaceutical Sciences has received unrestricted funding for pharmacoepidemiological research from GlaxoSmithKline, Novo Nordisk, the private-public funded Top Institute Pharma (www.tipharma.nl includes co-funding from universities, government and industry), the Dutch Medicines Evaluation Board, and the Dutch Ministry of Health. The views expressed in this paper are those of the authors and do not reflect the official policy or position of the MHRA, UK. Of all patients prescribed a statin by their GP within 2 months of hospital discharge, 30% received a high intensity dose, and 43% remained on treatment at 4 years. Cooper A, Nherera L, Calvert N et al. Clinical guidelines and evidence review for lipid modification: cardiovascular risk assessment and the primary and secondary prevention of cardiovascular disease. London: National Collaborating Centre for Primary Care and Royal College of General Practitioners, 2008.
Cooper A, Skinner J, Nherera L et al. Clinical guidelines and evidence review for post myocardial infarction: secondary prevention in primary and secondary care for patients following a myocardial infarction. London: National Collaborating Centre for Primary Care and Royal College of General Practitioners, 2007. Parkinson J, Davis S, van Staa TP. The General Practice Research (GPRD) Database: now and the future. In: Mann R, ed. Pharmacovigilance. Second edition. John Wiley & Sons, 2007. MINAP. http://old.rcplondon.ac.uk/clinicalstandards/organisation/partnership/pages/minap-aspx. Accessed February 2012. Ferrières J, Bataille V, Leclercq F et al. Patterns of statin prescription in acute myocardial infarction: the French registry of Acute ST-elevation or non-ST-elevation Myocardial Infarction (FAST-MI). Atherosclerosis 2009;204:491–6. Optimised beta blocker therapy in heart failure: is there space for additional heart rate control?